Back surgery is a form of treatment that is often recommended for chronic back pain when other forms of treatment have been found ineffective. Additional criteria for back surgery include pain that has begun to cause mobility problems, trouble sleeping, trouble completing work tasks, or difficulty while performing daily activities. Candidates for back surgery are usually categorized into two groups. The first group consists of individuals suffering from spinal stenosis, a herniated disc, spondylolisthesis, sciatica, vertebral fractures that have affected certain nerves, or chronic low back pain. The second group consists of individuals suffering from discogenic back pain (e.g., degenerative disc disease) and low back pain in the absence of leg pain. Unless a circumstance occurs (e.g., trauma) that makes immediate back surgery necessary, it is generally a last resort after medication, steroid injections, or physical therapy have been utilized and proven ineffective. An image of the back and spine, which is obtained through an x-ray or magnetic resonance imaging (MRI), is essential in helping a physician determine what type of surgery may be appropriate as well as the potential risks that will be associated with the procedure. There are various types of surgery and each type presents both risks and benefits; however, if the anticipated prognosis after back surgery is an increased quality of life, improved physical fitness, heightened mood, a reduced need for pain medication, and the ability to return to work, surgery will probably be recommended. In some cases, chronic back pain can cause psychological distress. If an individual has utilized conventional treatment methods such as medication or physical therapy and the emotional distress persists, a physician who recommends surgery may also insist that the patient undergo psychological therapy. There are benefits as well as risks associated with surgery, such as the possibility that symptoms may not improve after undergoing surgery and it is important that any recurring, negative emotions be dealt with in a therapeutic setting. One study also emphasized the importance of weighing the advantages and disadvantages of intensive rehabilitation programs versus surgery as in some cases intense rehabilitation programs provide individuals with similar amounts of pain relief as a surgical procedure, at a lower cost. The study involved following a large group of patients with chronic low back pain. The patients were between the ages of 18 and 55 and all experienced pain for at least one year. One group underwent surgical stabilization of the lower back and the second group enrolled in a rehabilitation program that consisted of education and exercises that were taught by physiotherapists and clinical psychologists. The average cost for the surgery was twice as much as the rehabilitation program, but the quality of life years that each method provided were very similar. There were also fewer risks associated with the rehabilitation program. Therefore, it is also important that a physician discuss which option may be optimal for each individual patient, unless surgery is unavoidable. A herniated disc, also known as a ruptured or slipped disc, occurs when the small discs that are located in between spinal vertebrae become damaged and either bulge or rupture. Discs that are intact help maintain spinal flexibility and function as shock absorbers, but damaged discs tend to cause pain by placing pressure on nerves. A herniated disc can occur in any part of the spine such as the upper and lower back or in the neck, but most herniated discs develop in the lower back. Common causes include wear and tear, which may occur with age or a spinal injury. Spinal injuries or wear and tear can cause cracks in the membrane of the disc and this leads to the leakage of fluid that causes the disc to either bulge or rupture. This condition can lead to excess pressure being placed on spinal nerves and severe pain, as well as numbness and weakness in the region of the body that the affected nerves extend to. A herniated disc can also cause sciatica, which is the occurrence of pain that originates from an inflamed sciatic nerve. This is a large nerve in the lower back that extends to the buttocks and down the back of the legs. A serious medical condition that may be caused by a herniated disc is cauda equina syndrome. This syndrome is characterized by numbness and weakness in both legs and a loss of bowel or bladder control. When these symptoms occur immediate medical attention is necessary. Spinal stenosis is the narrowing of the spinal canal that the spinal cord and spinal nerves run through. This may occur due to the overgrowth of tissue, such as when ligaments thicken, or may be a result of the excessive growth of bones, such as when individuals are suffering from arthritis. The narrowing of the canal squeezes nerves along the spinal cord, causing them to become irritated and inflamed. The inflammation of the nerves, and in some cases even the spinal cord, can lead to pain, weakness, and numbness in the back, legs, feet, and buttocks depending on the area in which the affected nerves are located. In extreme cases, a loss of bladder and bowel control may be experienced and some individuals may also start to have problems walking due to severe pain, tingling, and numbness in the legs. Spondylolisthesis is a painful condition that occurs when one spinal vertebra slides out of place and onto the spinal vertebra directly below it. This most commonly occurs in spinal vertebrae that are located in the lower regions of the spine. The spine generally tries to stabilize itself after this occurs, but the joints between the affected vertebrae may become enlarged and start pinching spinal nerves. This causes back pain as well as weakness or numbness in the legs and similar to a herniated disc, spondylolisthesis may also cause sciatica pain in the buttock and legs. Similar to other conditions that affect the back, symptoms such as bladder or bowel control may change and indicate that immediate medical attention is needed. In rare cases, a slipped disc may not cause any symptoms until years after it has occurred. When the symptoms eventually manifest themselves, muscles in the legs may feel weak or tight and the individual may even begin to limp due to the pain and muscle problems. Different types of problems with the small joints between the vertebrae can lead to the development of spondylolisthesis. For instance, a joint may be defective at birth, or become damaged by an infection, an accident, or arthritis. In addition, an overused joint can lead to a stress fracture within a vertebra and subsequently spondylolisthesis. Vertebral fractures are also known as spinal fractures or vertebral compression fractures. If a vertebra along the spinal column becomes fractured an individual may experience severe back pain, especially when trying to stand, sit, walk, or lift items. One of the most common causes of vertebral fractures is osteoporosis, which is a condition that makes bones brittle and prone to fracturing. However, blunt trauma can also cause vertebral fractures and in some cases, more than one vertebra may become fractured. There are several symptoms of a vertebral fracture, such as the sudden onset of severe back pain, an increase in pain when standing or walking, trouble bending or twisting, a decrease in height, and spinal deformities (e.g., a curved back). A fracture may also cause pressure to be placed on the nerves, which may lead to pain in the extremities. Furthermore, if multiple fractures have developed, digestive problems such as a bulging stomach, constipation, loss of appetite, and weight loss, may occur. Hip pain may also be experienced if the fractures have led to the shortening of the spine, and if the spine begins to significantly shorten, breathing problems may develop. Discogenic low back pain is a condition that generally develops as individuals age, due to the breakdown of the cartilage that protects the joints between vertebrae, or conditions such as a herniated disc and spinal stenosis. Both of the latter conditions cause excess pressure to be placed on both the spinal cord and spinal nerves, which leads to pain, tingling, numbness, and abnormal sensitivity. An age-related change that contributes to degenerative disc disease is the loss of fluid in spinal discs. These discs typically function as shock absorbers for the spine, but this change reduces their ability to do so. In addition, the loss of fluid causes the discs to become thinner, which narrows the spaces between vertebrae and shortens the spine. As individuals age, tiny cracks and tears also develop in the outer layers of the discs, which can lead to the bulging or rupturing of a disc, also known as a herniated disc. An individual who may need to undergo back surgery must be evaluated by an experienced physician who specializes in diagnosing spinal conditions. In the initial part of the examination the physician will find out about the patient’s medical history and then conduct a full physical assessment. During the physical exam, a series of flexibility and muscle strength tests will be conducted in order to begin to pinpoint the cause of the pain. An x-ray is usually the next step in diagnosing the cause of spinal pain as it allows bones and the spaces between the bones to be visualized; however, x-rays only show bones, and therefore, magnetic resonance imaging (MRI) is needed in order to visualize soft tissues such as spinal discs. An MRI produces detailed pictures of the structures inside the body through the use of a magnetic field and radio waves. A computed tomography (CT) scan is similar to an MRI because it also allows internal structures of the spine to be visualized. In particular, a myelogram, which combines the use of dye with a CT scan, is used to diagnose a bulging disc, a tumor, or changes in the bones surrounding the spinal cord and spinal nerves. Before the dye is injected into the spinal canal, a local anesthetic is injected into the lower back to numb the area and a lumbar puncture (spinal tap) is performed. This procedure helps reveal what structures may be causing the back pain. Electrodiagnostics are another set of tests that are conducted during the diagnostic session and entail the electrical testing of the nerves and spinal cord. These tests are called electromyography (EMG) or somato sensory evoked potentials (SSEP) and help the physician understand how the spinal condition may be affecting the nerves or spinal cord. A bone scan is an additional imaging option that may be obtained in order to detect an infection, malignancy, vertebral fracture, or arthritis in any part of the spine. Furthermore, a procedure known as discography is typically used to visualize the internal structure of the disc. Discography is performed under local anesthesia. Dye is injected into the disc under x-ray or CT scan guidance. The x-ray or CT scan is utilized to determine if a disc is healthy or abnormal. One major benefit of discography is that it allows the physician to determine the exact disc that is causing the pain. This ensures that the appropriate surgical procedure will be chosen and improves the probability of experiencing positive outcomes by reducing the risk of operating on the wrong disc. Injections and diagnostic blocks are pain-relieving diagnostic methods that can provide a physician with important information regarding how the spine and nerves may react to a certain surgical procedure. Diagnostic blocks are usually nerve blocks in which a needle is inserted into the spinal column at regions where affected spinal nerves are located. The placement of the needle is visualized with imaging technologies (e.g., fluoroscopy, x-ray, etc.) and once proper placement is confirmed, a catheter is inserted through the needle in order to administer pain-relieving medication to spinal nerves that are responsible for chronic pain. A steroid and anesthetic, or a substance that disintegrates nerve tissue, is injected in order to relieve pain and this treatment method leads to extended pain relief by blocking the transmission of pain signals. The effectiveness of the diagnostic nerve block provides an impression of whether or not a particular surgery will be successful or needed. More importantly, the more pain relief that is experienced from repeated diagnostic blocks, the greater the probability that positive outcomes will be experienced after surgery. Physicians usually prefer to observe positive outcomes from two diagnostic blocks before recommending surgery. When surgery is recommended, it may be beneficial to get a second opinion before undergoing a surgical procedure as some of the risks associated with surgery are potentially serious. Furthermore, undergoing a procedure that is inappropriate for the spinal condition that is causing pain can worsen the symptoms or make it necessary to undergo additional surgeries. Obtaining a second opinion helps ensure that surgery is necessary and that the appropriate procedure has been chosen. Discectomy is a procedure in which the damaged portion of a herniated disc, and sometimes a portion of a spinal ligament, is surgically removed. The affected herniated disc is generally removed through an incision that is approximately two inches or larger. Before this procedure is performed a physician will want to confirm the presence of severe pain in the extremities such as extreme back and leg pain or intense pain upon straightening or raising the leg. 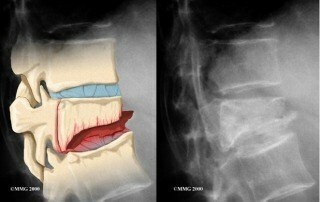 An image of the spine will also be obtained in order to confirm that a spinal disc is bulging or has ruptured. Once a disc becomes herniated, it can compress or irritate nerves in the same region and cause pain, weakness, and numbness in the back, buttocks, neck, or chest that can extend to the arms and legs. A fragment from a slipped disc may also become lodged in the spinal canal and place excess pressure on a nerve. A discectomy is most effective at reducing the symptoms that are experienced in the extremities, but is also helpful at relieving back or neck pain. Some individuals who suffer from a herniated disc that causes back pain experience significant pain relief from treatments such as prescription pain relievers, corticosteroid injections, and physical therapy. However, when these types of treatments are ineffective or an individual’s symptoms become worse, a physician may recommend a discectomy. Reports indicate that pain relief is rapid when patients are properly selected for this procedure and that positive postoperative results last for up to one year or longer; however, if patients are misdiagnosed, the probability that the discectomy will fail to provide relief greatly increases. When optimal candidacy for a discectomy is confirmed, in order to reduce the pain and size of the surgical scar that is associated with this procedure as well as the risk of damaging healthy tissue, a microdiscectomy may be performed. A microdiscectomy involves making a very small incision and using a magnifying microscope to locate and remove the damaged disc through the incision. Reports indicate that the recovery time for a microdiscectomy and a discectomy are approximately the same. Additional medical advances over the years have led to the use of lasers to perform surgery on patients who have herniated discs that are causing low back and leg pain. During laser surgery, a needle is inserted into the affected disc and several bursts of laser-generated heat are induced in order to vaporize the tissue in the disc. This procedure reduces the size of the disc, thereby relieving pressure on the nerves. Many patients who undergo laser surgery can return to their normal activities within three to five days after the laser surgery, but significant pain relief may not become apparent until several weeks or even months following the surgery. A foraminotomy is a procedure in which bones on the side of vertebrae are surgically removed or shaved down. The purpose of this surgery is to widen the opening in the back where nerve roots exit the spinal cord, in order to relieve pain that is being caused by compressed nerves. This also increases the mobility of the spine. The removal of bone may cause the spine to become unstable; therefore, a spinal fusion may be performed at the same time. Performing both procedures simultaneously increases the operation and recovery time, but prevents the need of having to undergo an additional surgery if it is discovered after the foraminotomy that the spine has become unstable. A foraminotomy is often recommended when an individual is suffering from severe pain in the lower back, thighs, calves, shoulders, arms, or hands that is semi-constant or increases during activity. Numbness, tingling, and muscle weakness in the extremities is also an indication that a foraminotomy may be necessary. A laminectomy, also called a decompression laminectomy, is one of the most common surgical procedures that is performed in order to treat spinal stenosis. Similar to a foraminotomy, a laminectomy involves relieving pressure on the spinal cord and spinal nerves that may have been caused by age-related changes, trauma, or an infection. A laminectomy is different from a foraminotomy in that a large incision is made in order to remove the back portions of vertebrae (lamina) that cover the spinal cord, in addition to ligaments and bone spurs, which are extra bone fragments that form when the spine tries to repair itself. A laminectomy widens the spinal canal, thereby relieving pressure on nerves and is typically performed in conjunction with a spinal fusion. If both procedures need to be performed, a short hospital stay will be required and physicians normally recommend physical therapy afterward in order to help the individual regain mobility and strength. Surgery for spinal stenosis, such as a laminectomy or foraminotomy, typically provides significant pain relief, and patients typically report a dramatic improvement within three months of the surgery. In addition, the pain relief usually lasts for up to four years, and in some cases, between eight to ten years. A spinal fusion is an invasive procedure in which two or more vertebrae are fused together by using bone grafts, rods, and screws in order to correct damage that was caused by a vertebra that slipped over the vertebra directly below it (spondylolisthesis). It is generally performed along with a laminectomy. A slipped vertebra can lead to the enlargement of facet joints, which leads to spinal cord and spinal nerve compression as well as serious pain. Portions of the vertebrae have to be removed and bones that are used for grafting purposes are usually taken from other parts of the body such as the hips or pelvis, or from an individual who agrees to be a bone donor. The grafted bone is used to create a bridge between the slipped vertebra and the one it was lying on top of in order to help straighten the spinal column. The grafted bone also stimulates the growth of new bone tissue along the spine. In some cases, an additional fusion procedure called instrumented fusion is necessary and involves screwing metal implants (e.g., hooks, wires, or plates) onto the vertebrae in order to keep them in place while the new bone begins to grow between them. The implants also further stabilize and strengthen the spine during the healing period. This type of surgery is generally successful, but using grafts has its disadvantages. For example, removing bone from other parts of the body means undergoing more than one surgical procedure. Using bone that was donated from another individual creates the risk of disease transmission or the rejection of the bone by the body. Furthermore, because the fused area of the spine becomes immobilized, there will be a slight decrease in mobility of the spinal column. A physician will typically recommend physical therapy in order to strengthen the muscles in the back and help improve mobility along the spine. Vertebroplasty and kyphoplasty are minimally invasive procedures that are performed in order to treat vertebral compression fractures. These types of fractures are described as the deterioration or collapse of spinal vertebrae and may develop due to osteoporosis, as the result of a traumatic injury, or from bone cancer metastasis. Indications for performing one of these procedures include chronic back pain that is unresponsive to conventional treatment methods, rest, analgesics, corsets, or braces. Vertebroplasty involves a patient lying on the stomach and having a needled inserted through the skin and affected vertebrae. An imaging technique such as x-ray imaging or fluoroscopy is used during the placement of the needle to ensure that it is inserted at the right location. Cement is then inserted into the spinal vertebrae, which helps restore the length of the spinal column and straightens excessive spinal curving. There is a slight risk of cement leakage with this procedure, but the occurrence is minimal. Kyphoplasty is performed in the same way, but entails inserting an inflatable balloon as opposed to cement. This procedure may involve a bipedicular method, where two balloons are utilized, or a unipedicular method that involves one balloon. There are a few risks associated with these procedures. Patients who undergo vertebroplasty may experience a higher incidence of anemia as a result of temporary bleeding after the procedure, as well as a higher incidence of blood clotting in veins. In some cases, kyphoplasty may increase the risk of cardiac complications, but this is often observed in older individuals suffering from several conditions. Therefore, vertebroplasty is performed more often than kyphoplasty on patients with several conditions. Nonetheless, as the risk of cardiac complications is generally low, kyphoplasty is the preferred method due to lower complications rates as well as a shorter length of stay in the hospital. Some patients only need to stay in the hospital overnight after the procedure is performed, while others may be allowed to return home the same day. Disc replacement surgery involves inserting an artificial disc between spinal vertebrae after surgically removing the damaged spinal disc. This procedure is becoming a popular alternative to spinal fusions as it enhances the mobility of the spine. The recovery time for a disc replacement is also shorter than that of a spinal fusion. 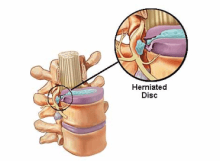 Disc replacement surgery is also an alternative to a discectomy for a herniated disc. Replacing the damaged disc with an artificial one has the ability to restore disc height and subsequently the height of the spine, and also improves movement between the vertebrae. The day after undergoing disc replacement surgery, patients are often encouraged to start standing up and walking around as it is not necessary to wait for bones to begin healing before returning to normal activities; however, the patient will probably remain hospitalized for two to four days. Reports indicate that although this procedure generally does not completely alleviate back pain, it does provide dramatic pain relief. Currently, different approaches to disc replacement surgery are being developed and tested in the hopes of further improving the postoperative results. After having a surgical procedure, the length of the hospital stay will depend on the physician’s decision and it could be anywhere from one day to several days. In some cases, physical therapy will be recommended after the surgery in order to help increase strength and flexibility. Pain relief may be experienced shortly after the procedure, but it may take several weeks or months before an individual is able to return to normal activities, especially when more than one procedure is performed at the same time. Undergoing the appropriate surgical procedure improves the probability of positive results and visualization of the spine is one of the best methods for ensuring that the optimal type of surgery will be chosen. The most common risks that are associated with back surgery include bleeding, infection, and reactions to the anesthesia or other drugs that may have been administered during the procedure. Blood clots in the legs or lungs may also develop and there is a potential risk of stroke or heart attack. Furthermore, when disc herniation surgery is performed, there is an increased risk that disc herniation will occur again. One of the most serious risks associated with back surgery is possible nerve damage, which may cause increased pain, muscle weakness, paralysis, the loss of bladder or bowel control, or sexual dysfunction. In some cases, the surgical procedure may not be effective at relieving the pain and may actually worsen the symptoms. Certain types of surgeries are also associated with particular risks. For example, spinal fusion, which is the most commonly performed surgical procedure for back pain, may cause restricted movement and the limited ability of nerves to stretch due to the fusion of spinal vertebrae. Furthermore, the incomplete fusion of the vertebrae is a risk that is unique to the spinal fusion procedure. If this occurs, an additional procedure becomes necessary. 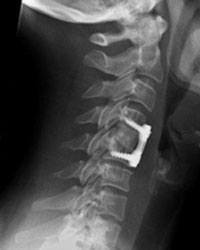 The occurrence of incompletely fused vertebrae is uncommon, but smoking increases this risk, as well as the risk of developing an infection after surgery. A laminectomy presents the risk of a partial loss of stability in the spine due to the fact that portions of bone and ligaments are removed during this procedure. The purpose of this surgery is to relieve pressure being placed on nerves that may have been causing pain and muscle weakness, but if a laminectomy leads to an unstable spine then a spinal fusion will need to be performed. However, these two procedures can be performed simultaneously if a physician discovers that it is necessary. A foraminotomy can also cause decreased stability of the spine, due to portions of the bones at the side of spinal vertebrae being surgically removed to provide more space for the nerve roots. The purpose of this procedure is to alleviate pain by relieving excess pressure that was being placed on the nerves. However, removing pieces of bone from the vertebrae can weaken the spine. This approach is similar to a laminectomy and a physician may recommend that the patient undergo a spinal fusion at the same time as the foraminotomy. Although performing both procedures simultaneously increases the operation time as well as recovery time, it prevents spinal instability. A patient may elect to only undergo the foraminotomy and if the spine loses its stability afterward, a spinal fusion can be performed at that time. Additional risks that are associated with a foraminotomy include bleeding, injury to spinal nerves that may cause an increase in pain or a loss of sensitivity, or the development of an infection at the injection site or within the vertebrae that were operated on. 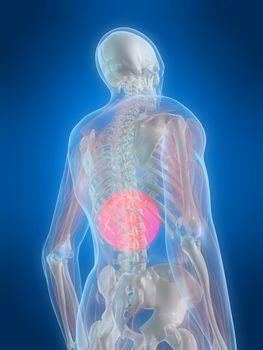 Risk associated with a discectomy include, bleeding, infection, or the leakage of spinal fluid. In addition, there is a risk of injury to blood vessels or spinal nerves as well as injury to the protective layer that encloses the spine. This procedure may also be performed in conjunction with a laminectomy, foraminotomy, or spinal fusion, which extends the operating and recovery time. Disc replacement surgery poses the risk of internal injury if the artificial disc bends, breaks, becomes dislodged, or fails to improve spinal movement. Additional risks include having an allergic reaction to the material that the artificial disc is made from, tissue swelling, the development of an infection, tingling or numbness in the extremities, or a loss of function at the treated spinal area. This procedure poses more serious risks such as internal bleeding or blood that pools under the skin due to a broken blood vessel (hematoma) and the formation of blood clots, which can lead to a stroke. Nerve or spinal cord damage may also occur, and in rare cases can lead to paralysis. Despite the risks and side effects, successful back surgery can provide patients with benefits such as significant or complete pain relief, increased activity and range of motion, enhanced physical fitness, and a heightened mood. Additional benefits include a reduced need for pain medication, especially prescription medication. Furthermore, individuals who were unable to work prior to undergoing surgery may also be able to return to work and increase their work performance. Back surgery is a treatment option for chronic back pain and is usually recommended when other forms of treatment such as medication, steroid injections, or physical therapy have been ineffective. Individuals who are candidates for surgery include those suffering from spinal stenosis, a herniated disc, spondylolisthesis, sciatica, vertebral compression fractures, chronic low back pain, and discogenic back pain (e.g., degenerative disc disease). Indications for back surgery include intractable chronic pain that persists anywhere from six weeks to six months and is unresponsive to conventional treatments methods. Ongoing nerve damage and muscle weakness, abnormal sensitivity, and changes in bowel or bladder control are also indications for back surgery. The most common risks that are associated with back surgery include bleeding, developing an infection, and reacting to anesthesia or other drugs that may be administered during the procedure. More serious risks include blood clots in the legs or lungs that can increase the risk of having a stroke or heart attack, as well as nerve damage, which may cause increased pain, muscle weakness, paralysis, the loss of bladder or bowel control, or sexual dysfunction. Although there are serious risks associated with back surgery, if a patient may experience enhanced physical fitness and mood, a reduced need for pain relievers, an increased quality of life, and the ability to return to normal activity after the procedure, it may be best to undergo surgery. Deukmedjian AJ, Jason Cutright ST, Augusto Cianciabella PC, Deukmedjian A. Deuk Laser Disc Repair(®) is a safe and effective treatment for symptomatic cervical disc disease.Surg Neurol Int. 2013;4:68. Goz V, Errico TJ, Weinreb JH, Koehler SM, Hecht AC, Lafage V, Qureshi SA. Vertebroplasty and kyphoplasty: national outcomes and trends in utilization from 2005 through 2010. Spine J. 2013; in press. Grunert P, Hudson KD, Macielak MR, Aronowitz E, Borde BH, Alimi M, Njoku I, Ballon D, Tsiouris AJ, Bonassar LJ, Härtl R. Assessment of Intervertebral Disc Degeneration Based on Quantitative MRI Analysis: An in Vivo Study. Spine (Phila Pa 1976). 2013; in press. Jacobs W, Van der Gaag NA, Tuschel A, de Kleuver M, Peul W, Verbout AJ, Oner FC. Total disc replacement for chronic back pain in the presence of disc degeneration. Cochrane Database Syst Rev. 2012;9:CD008326. Klazen CA, Lohle PN, de Vries J, Jansen FH, Tielbeek AV, Blonk MC, Venmans A, van Rooij WJ, Schoemaker MC, Juttmann JR, Lo TH, Verhaar HJ, van der Graaf Y, van Everdingen KJ, Muller AF, Elgersma OE, Halkema DR, Fransen H, Janssens X, Buskens E, Mali WP.Vertebroplasty versus conservative treatment in acute osteoporotic vertebral compression fractures (Vertos II): an open-label randomized trial. Lancet. 2010;376(9746):1085-1092. Li LH, Sun TS, Liu Z, Zhang JZ, Zhang Y, Cai YH, Wang H. Comparison of unipedicular and bipedicular percutaneous kyphoplasty for treating osteoporotic vertebral compression fractures: a meta-analysis. Chin Med J (Engl). 2013;126(20):3956-3961. K. Low back pain after lumbar discectomy in patients showing endplate modic type 1 change. Spine (Phila Pa 1976). 2010;35(13):E596-E600. Raja RA, Khemani VD, Lakhair MA, Khan SA. Discectomy in single level lumbar disc disease. J Ayub Med Coll Abbottabad. 2012;24(2):81-83. Rivero AO, Campbell H, Gray A, Fairbank J, Frost, H, MacDonald, JW. Surgical stabilization of the spine compared with a program of intensive rehabilitation for the management of patients with chronic low back pain: cost utility analysis based on a randomized controlled trial. BMJ. 2005;330(7502):1239-1244. Spoor AB, Öner FC. Minimally invasive spine surgery in chronic low back pain patients.J Neurosurg Sci. 2013;57(3):203-218. Weinstein JN, Tosteson TD, Lurie JD, Tosteson A, Blood E, Herkowitz H, Cammisa F, Albert T, Boden SD, Hilibrand A, Goldberg H, Berven S, An H. Surgical versus nonoperative treatment for lumbar spinal stenosis four-year results of the Spine Patient Outcomes Research Trial. Spine. 2010;35(14):1329-1338. Willems P. Decision making in surgical treatment of chronic low back pain: the performance of prognostic tests to select patients for lumbar spinal fusion. Acta Orthop Suppl. 2013;84(349):1-35.